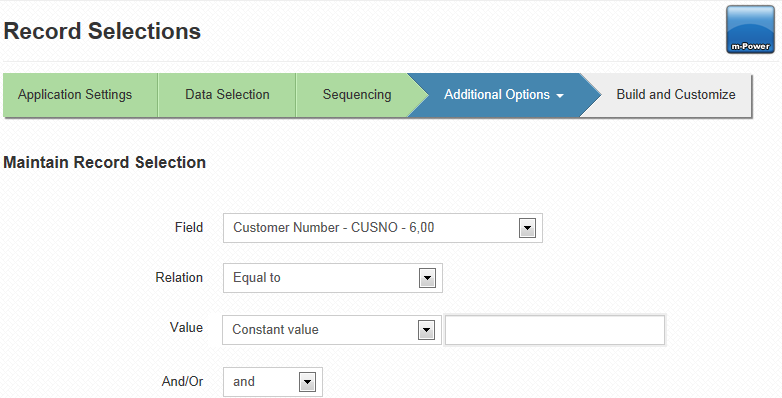 Record Selections can be used to display subsets of data in an application. For instance, imagine a retrieval built over a sales history table with over 100,000 records. It is not always practical to show all 100,000 records at one time. Perhaps an end-user needs to be able to select a particular date range, or the data needs to be secured so that employees in different departments can only access specific sales records. Record selections make these types of tasks possible. Field- Select the desired field. This list is populated by all fields currently selected in the application build process. Relation- Select the desired relationship. Value- Select either Constant Value, Application Field Value, or Runtime Value Prompt (only available in reports and summaries). Enter a value, as necessary. You can select either Constant Value, Application Field Value, or Runtime Value Prompt from the value drop down depending on the application type. If choosing Constant Value, input a value. This value, which the end user cannot change, will be compared to the field based on the relationship chosen. Choosing Application Field Value will allow you to select another field in your application to compare against the previously selected field. If you would like your end-user to have the option of inputting a value at runtime, select Runtime Value Prompt. And/Or- Select "And" if you would like the the application to be filtered by the current record selection and the subsequent record selection, or "Or" if you would like the application to be filtered by either record selection. Once you've entered the specifications, click accept. You will be brought to the following screen. From this page you can edit, copy, delete, or reorder any existing record selections. Additonally, you can create a new record selection by clicking on the green plus sign. For more information on record selections, click here.